AudioControl will be expanding its amplifier offering at ISE 2019, with the company set to announce a new CM line of 70/100V amplifiers, new home cinema amps, and a solution for those with smart speakers. The biggest launch for AudioControl at ISE 2019 will arguably be in new CM Series 70/100V amplifier solutions, which deliver 750W per channel all-channels-drive. These new amplifiers have been specifically designed with flexibility in mind, allowing for nearly any system configuration. That makes it ideal for both residential and commercial applications. Unlike many of the competing amplifiers on the market, AudioControl’s new CM Series 70/100V amplifiers offer DSP control and signal matrixing capabilities, enabling integrators to precisely tailor the sound by zone to any environment. Additionally, CM Series amps support dual mode functionality, enabling simultaneous 70V and 8-ohm operation on selected channels – plus digital and analogue audio inputs. The latest addition to AudioControl’s line of home cinema amplifiers is the new Avalon G4, a high-performance 4/3/2 channel amplifier capable of driving the height channels as part of an immersive surround system (4-channel – 230 watts @ 8 ohm, 300W@ 4 ohms) or a 2.1 audio system (stereo pair plus bridged pair), as well as a dedicated two-channel music system delivering 600W bridged into 8 ohm loudspeakers. Each pair of channels features hi/lo/bypass crossover controls, balanced (XLR) and unbalanced (RCA) inputs, as well as RCA. The 2U rack space Avalon G4 also features independent channel level controls, five-way binding posts and switchable 110/220-volt operation. 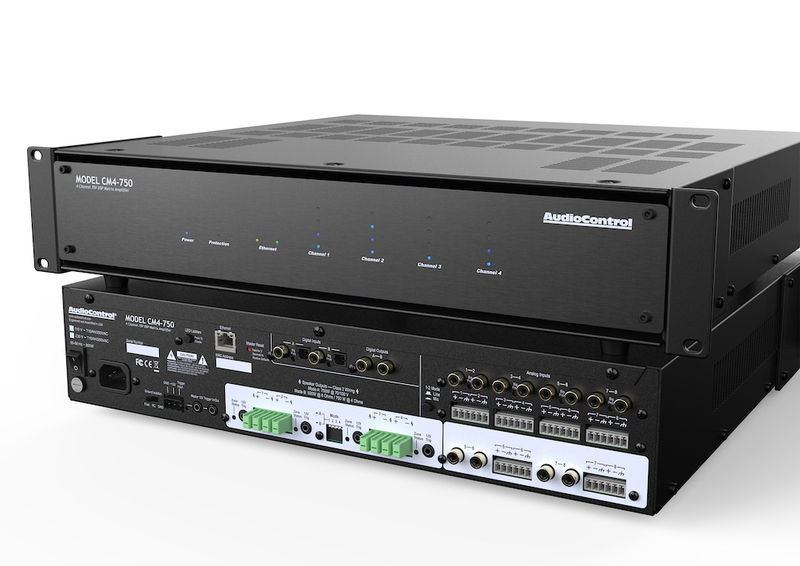 AudioControl’s new Rialto 400 features a smart-switching auxiliary input capable of overriding both digital and analogue inputs when it senses signal. This enables the user to query using voice commands on Amazon Echo or Google Home and rely on the Rialto 400 to pause either input, provide the response from either automated device and immediately switch back to whichever input was active.